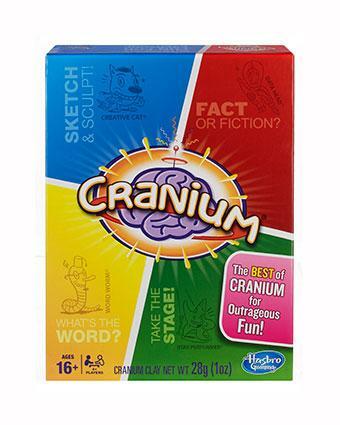 Playing Cranium is one hour of pure fun for 4 to 16 teenagers and adults at a party or family gathering. Players are challenged to sing, dance, draw, spell, answer trivia questions and a host of other activities. There is something in this game for just about everyone. Whit Alexander - An ecologist, teacher, software developer, urban planner, policy wonk and data processing wizard in Africa who also produced the maps for the first version of Microsoft's Encarta Encyclopedia. It quickly gained popularity as a fun party game and as an alternative for other team-oriented adult party games which were popular at the same time such as Trivial Pursuit, Pictionary and Charades. The game won the 2001 Toy of the Year award from the Toy Industry Association. It also went on to win the 2003 Vuoden Ajkuistenpeli award, the Finnish Adult Game of the Year Award. Players divide into teams of two to four players. It's a good idea to assign team members so that a broad variety of personalities and skills are on each team.Teams take turns moving around the board completing challenges. Red - A team member is chosen to answer a variety of trivia questions in Q&A and True/False-style challenges. Yellow - These challenges are completed by a team member who is chosen to complete word-oriented challenges such as words to unscramble, difficult words to spell, definitions to guess, guessing words with missing letters and spelling words backwards. Blue - A team member gives clues to team members by acting out a clue, whistling a song or impersonating a celebrity. Green - A team member gives clues to team members by drawing, sculpting in clay or drawing with closed eyes. If the team lands on a Brain space, the team gets to choose the type of challenge they want to work on. As challenges are completed, teams move around one of the two tracks on the boards. The "Norrmal Track" is the standard track. To get on the "Fast Track", a team must successfully complete the first challenge while they are on a Brain space. They can stay on the "Fast Track" until they come to the next brain space. Both tracks lead to the End Zone. It's easy to lose track of time while playing this game because the action is ever-changing. The wide variety of fun challenges can be met by players with all types of personalities and interests. It would be a fun game for school and teen activities. The winning team is the first team to complete one of each type of challenge and get to the End Zone. The fun of this game is watching people attempt to give clues to their team members using skills that are not their strengths - like tone-deaf people trying to sing, people trying to draw pictures with their eyes closed or non-artistic people trying to draw clues with their eyes open!